largest energy generating tidal turbine. 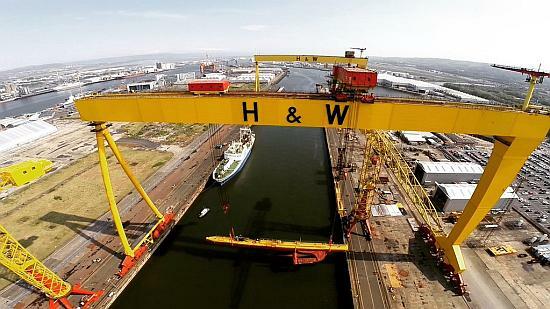 The company, which is at the forefront of the floating tidal technology sector, launched the 550 tonne machine at Harland & Wolff yard in Belfast, N. Ireland. This is the first commercial scale machine the company has built. The turbine will undergo preliminary tow trials in Belfast Lough before being towed to the European Marine Energy Centre (EMEC) in Orkney to commence a grid connected test programme. The SR2000 is the culmination of more than 12 years of a detailed and incremental engineering R&D programme, with the project being supported by £1.25 million funding from the Scottish Government. The turbine design follows Scotrenewables’ floating generating platform philosophy, which the company expects will deliver a step-change cost and risk reduction to the commercial tidal energy sector. In parallel with the SR2000 project, Scotrenewables has also been selected by the European Commission to lead on the engineering and delivery of a further enhanced model of the SR2000 machine for demonstration alongside the existing unit. Under a Horizon 2020 funding call Scotrenewables — which has a direct workforce of 25 people in Kirkwall — will lead a consortium of (nine) parties to optimise the SR2000 under the £10 million “FloTEC” project. The company’s progress has been underpinned by investment of more than £25 million from main investors who include the Renewable Energy Investment Fund, DP Energy, Fred Olsen Group and Total New Energies. Steel fabrication of the machine was carried out by fabricators in Scotland, N. Ireland and England.